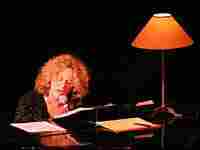 Carole King Invites Fans into the 'Living Room' Scott Simon talks with singer-songwriter Carole King, who is on tour for her new double-CD set, Welcome to My Living Room. Carole King is on tour this summer, with an objective: to make her audiences feel at home, even in large venues such as New York's Radio City Music Hall. Her Living Room Tour from last year is now captured on a CD, Welcome to My Living Room, and she is repeating the event this year. "Last year when I did this tour, I myself had a little trepidation whether [the concept] would work," King, 63, tells Scott Simon. "And it did. I don't know how, except that... I made it feel like it was a living room and I was just speaking to a small collection of friends. The fact that it was a larger collection of friends didn't seem to deter anyone from getting into the spirit." The CD, being released Tuesday, contains 27 songs spanning her career. Two of them are new: "Welcome to My Living Room" and "Loving You Forever," a duet co-written and performed with guitarist Gary Burr. The tour concludes in Santa Rosa, Calif., on Aug. 14.